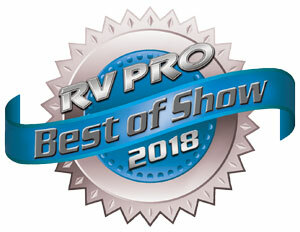 SHIPSHEWANA, IN – KZ was recently awarded the 2018 Best of Show by RV Pro magazine. Featured was the new Sportster 301THR travel trailer toy hauler. The announcement was made by Bradley Worrell, RV Pro’s editor. RV Pro is a monthly trade publication serving the RV industry. The Best of Show Award is RV Pro’s take of the best RVs displayed at this past year’s 55th National RV Trade Show, held in Louisville, Kentucky. The award highlights outstanding RVs in every category, from entry-level travel trailers to luxury diesel pushers. “Receiving the Best of Show designation and being recognized by the media is quite an honor,” stated Brent Froman, KZ product manager. “The 301THR was enthusiastically displayed at this past December’s Louisville Show, and offers a 102-inch wide exterior, Smart Arm power awning, 15-foot cargo area, a retractable screen wall and diamond plate threshold, and a large king slide that gives the trailer an open feel not found in most travel trailer toy haulers,” Froman added. “It’s exciting to be chosen by RV Pro as one of the most innovative RV debuts this year. Sportster continues to offer the best value in the market for toy haulers,” Froman concluded. Froman may be reached at (260) 768-2070, or bfroman@kz-rv.com. A link to the Sportster 301THR landing page follows: https://www.kz-rv.com/products/sportster-travel-trailer-and-fifth-wheel-toy-haulers/travel-trailer-toy-hauler-301THR.html.